Preheat oven to 375 degrees. Remove the giblets from the Cornish hens and place them on a cutting board, breast side down. Using sharp kitchen shears cut down each side of the backbone, starting from the neck end down to the tail. Remove the backbone, pull open the hen, flip it over and lay it flat. Season the front and underside of the bird with kosher salt and pepper. In a small bowl mix together butter, garlic, lemon zest, rosemary, sage and thyme. Using your finger loosen the skin from the breast and stuff the lemon herb butter under the skin directly on top of the breast. Stuff each chicken with equal parts butter - leave at least 1 tablespoon of the butter in the bowl. Use the remaining tablespoon of butter to rub over the top of each hen. Place your birds onto a rimmed baking sheet and place in the oven. Cook until the skin is golden brown and the when tested in the thigh it reaches 160 degrees. You will know the hen is fully cooked when you wiggle the wing or leg and it easily jiggles. Let the chicken rest for at least 5 minutes (I usually let mine rest 10 minutes) and devour. Combine the chicken, bacon, barbecue sauce, cheese, chives, parsley, garlic, and crushed red pepper flakes in a bowl and mix well to combine. The mixture should hold together when pinched between two fingers. Lay one egg roll wrapper in front of you like a diamond with a point facing your belly. Scoop about ¼ cup of the filling into the center of the egg roll wrapper and compact it into a tube shape so that it runs from side to side. Fold the point of the egg roll wrapper nearest you over the tube of filling and pull back gently on it to compact it further. Fold the left side in over that followed by the right side, and gently roll it away from you until you have just a couple inches left. Moisten your finger and run it along the edge of the egg roll wrapper, then finish rolling it up, smoothing the seam with your finger to help hold it in place. Repeat until you run out of filling and wrappers. Heat your oil to 340°F. Lower several egg rolls into the oil, taking care not to overcrowd them. Fry for 6 minutes, or until light golden brown. Remember they will continue to darken as they drain! Transfer the fried egg rolls to a paper towel lined plate to drain and repeat frying batches and draining. Let cool for at least 5 minutes before attempting to eat! Preheat your oven to 350°F. Line a baking sheet with aluminum foil and spritz lightly with oil or non-stick cooking spray. Lay the egg rolls on the baking sheet and spritz them lightly with the oil or non-stick cooking spray. Bake for 25-30 minutes, turning halfway through, or until golden brown and delicious. The will be slightly less crisp than their fried counterparts, but still delicious. Heat oven to 375 degrees F. Prepare a 9x13-inch baking dish with cooking spray. Pour about 3/4 cup enchilada sauce in the baking dish, and spread until the bottom of the dish is coated. Top with a layer of about 8 tortilla halves so that the entire dish is covered. Sprinkle evenly with about 1 cup black beans, 1/2 cup corn and a fourth of the green onions. Then sprinkle with a heaping cup of the chicken, and about 3/4 cup shredded cheese. Repeat with a second layer of tortillas, then sauce, then beans, corn, green onions, chicken, and cheese. Then a final layer of tortillas, sauce, beans, corn, green onions, chicken and cheese. Then conclude with a final layer of tortillas and sauce (reserving about 3/4 cup of cheese to add partway through baking). Cover the pan with aluminum foil, then bake for 20 minutes. Remove pan and remove aluminum foil. Sprinkle the top of the enchiladas evenly with the remaining 3/4 cup of cheese, then return to the oven (uncovered) and bake for 10 minutes or until the cheese is melted. Remove pan, and sprinkle with avocado, cilantro, and remaining green onions. Serve warm. Place cauliflower in a large roasting pan or jelly-roll pan. Drizzle with oil; toss well to coat. Bake at 450° for 20 minutes or until tender and browned, stirring every 5 minutes. Sprinkle with parsley, thyme, tarragon, and garlic. Bake 5 minutes. Combine cauliflower mixture, cheese, and remaining ingredients in a large bowl; toss well to combine. Heat a large nonstick skillet over medium-high heat. Coat pan with cooking spray. Add ground pork to pan; cook 5 minutes or until browned, stirring to slightly crumble. Drain well. Transfer pork to an electric slow cooker. Recoat pan with cooking spray. Add pork shoulder; cook 5 minutes or until lightly browned, turning occasionally. Transfer pork to slow cooker. Recoat pan with cooking spray. Add onion and bell pepper; sauté 8 minutes, stirring frequently. Add garlic; sauté 1 minute. Add tomato paste; cook 1 minute, stirring constantly. Stir in beer; cook 1 minute. Transfer onion mixture to slow cooker. Add 1/4 teaspoon salt, chili powder, and next 9 ingredients (through ham hock) to slow cooker. Cover and cook on HIGH 5 hours or until meat is tender. Remove bay leaves and ham hock; discard. Stir in remaining 1/4 teaspoon salt and sugar. Ladle about 1 1/3 cups chili into each of 8 bowls; top each serving with 1 tablespoon cilantro, 1 tablespoon green onions, and 1 tablespoon cheese. Serve each serving with 1 lime wedge. Note: You can also cook the chili in a slow cooker on LOW for 8 hours. 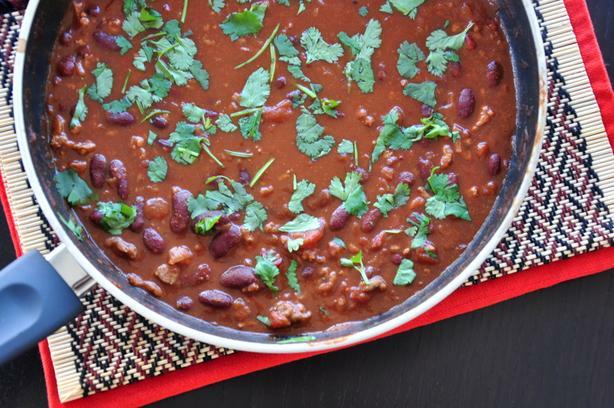 For cooking chili on the stovetop, use a total of 12 ounces beer and simmer, covered, for 2 1/2 to 3 hours or until the pork shoulder is tender.